On arrival at Málaga airport you can choose between 3 alternative modes of transport in order to reach your Axarquia resort destination. Hire a car: You could hire a car for the duration of your stay picking it up at the airport from one of the many car hire firms based there. On leaving the airport keep to the left following the sign for Malaga and then head for the N340/E15 autovia (motorway) in the direction of Motril and Almería. Depending on your final destination the journey should take between 40 -60 mins. Get a taxi: There are usually plenty of taxis waiting at the rank, the one way fare should be around €50 depending on your destination. Ask the taxi driver for a price before you get in the cab to avoid any nasty surprises on arrival! Get the bus: The bus service is excellent and offers a very cheap alternative. Take the no.19 for the 15 minute journey from the airport to the main bus station in Málaga. Once there, go into the main building and find the ticket window for Alsina Graells (located at the windows numbered 17-20) where you can buy your ticket and they will be able to tell you when your bus is due to depart and which number bus stop to go to. If you want to explore the region a little during your stay here then hiring a car, whether for the whole of your stay or just a few days, is a good idea. One of the easiest ways to track down a bargain is through the internet. Holiday Autos are a good place to start as they have an easy to use search facility which offers good prices and a choice of pick-up either at the airport or in Nerja. Record rent a car are based in Spain and offer pick-ups at Malaga airport. Avis also offer pick-ups from Malaga airport. With a modern network of autovias - motorways and well maintained carreterras - main roads, driving in Spain is no longer the clichéd nightmare that it undoubtedly was during the 60's and 70's. However the Spanish driving style is still somewhat erratic and a cautious approach to other drivers is recommended. In towns it is common for the driver in front of you to stop suddenly and for no apparent reason until you realise that they have just spotted a friend or relative and have stopped for a chat. Likewise if the parking spot outside the shop they are planning to visit is occupied they see nothing wrong in stopping there anyway and blocking the road up while they pop inside. Zebra crossings are approached differently here too, where the pedestrian engages in a finely judged game of dare with the motorist who generally only feels obliged to stop once someone is actually walking across in front of them. So be warned - keep on the alert at all times and constantly expect the unexpected! 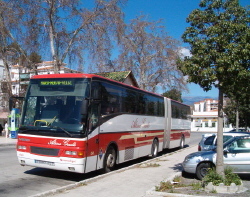 The local network of buses operated by Alsina Graells serves the main resorts well, offering an efficient and dependable service on very comfortable air-conditioned coaches. As most buses only run once an hour it is a good idea to plan your journey in advance. Once in the resorts you can pick up the timetable at the Tourist Information Office or at the ticket office at the bus station. Taxis are regulated fairly strictly here, prices are controlled and reasonably consistent and all the cabs are licensed and use the town ranks. The downside is that there never seem to be enough of them around at night and you should be prepared to stand at the rank for 20 minutes or so waiting for one to return. If you can get hold of one on the phone you can arrange a pick-up but this is easier said than done as most of the phones are at the ranks and are only answered when there are no passengers already waiting there.